The town, not the bathroom. 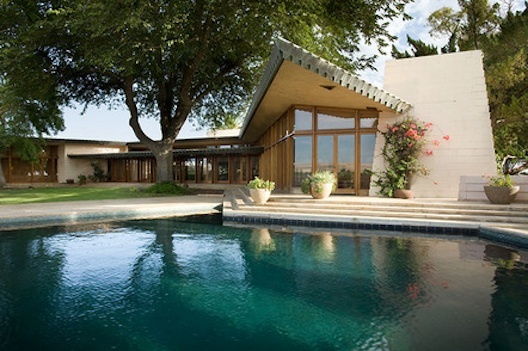 This Frank Lloyd Wright designed house is for sale in Los Banos, CA. The house was designed and built for Buck and Harriet Fawcett-I find it fascinating that someone in their 30’s could afford and have built this stunning home on 80 acres. I think I could consider living in a remote location to get a house like this. On and off the market for a few years, the house is still available for nearly $2 million. Unfortunately, Frank Lloyd Wright did not live to see the completion of the home.